Is No Kill Going Mainstream? In 1999, a small shelter in San Diego launched what it called “Home 4 the Holidays,” a pet adoption drive to place animals in homes between Thanksgiving and New Year’s Day. A handful of other San Diego shelters joined the effort. In 2014, the campaign reported over 4,000 participating shelters and over 750,000 animals adopted. Of course, shelters don’t have to officially join Home 4 the Holidays to do such adoptions and many shelters and rescue groups that do holiday adoption campaigns do not; Home 4 the Holidays did not invent the concept. In fact, even at the time of the campaign’s launch, Holiday adoption drives were not a “new” idea. Progressive shelters had been doing them for years and, in fact, at about the same time as the campaign began, a national study showed that animals placed in homes as gifts were some of the most successful adoptions and the least likely to fail. But what the Home 4 the Holidays program did do was brand, expand and aggressively promote the concept. These changes, combined with successfully marketing the idea nationally, led to an institutional shift in thinking which resulted in many traditionally regressive shelters which refused to do such adoptions doing an about face to embrace them. The success of the Home 4 the Holidays campaign and the number of shelters participating gave them permission to do so, too. Today, holiday adoption drives are not controversial (though objectively speaking, they never really were, or at least they shouldn’t have been). But back then, some shelters refused to do any adoptions during the holiday season. Why? Because for many years, the nation’s large non-profits opposed them and schooled shelters to do the same. In fact, Home 4 the Holidays was launched, in part, in response to this traditional shelter dogma, led by the Humane Society of the United States, that said shelters should not do adoptions during the holidays, arguing that “a dog adopted in December would be returned to the shelter in January.” At the same time, HSUS was also tenaciously opposing other programs and services which would have provided those shelters with alternatives to killing, effectively consigning the animals who might otherwise have been adopted during December to death. 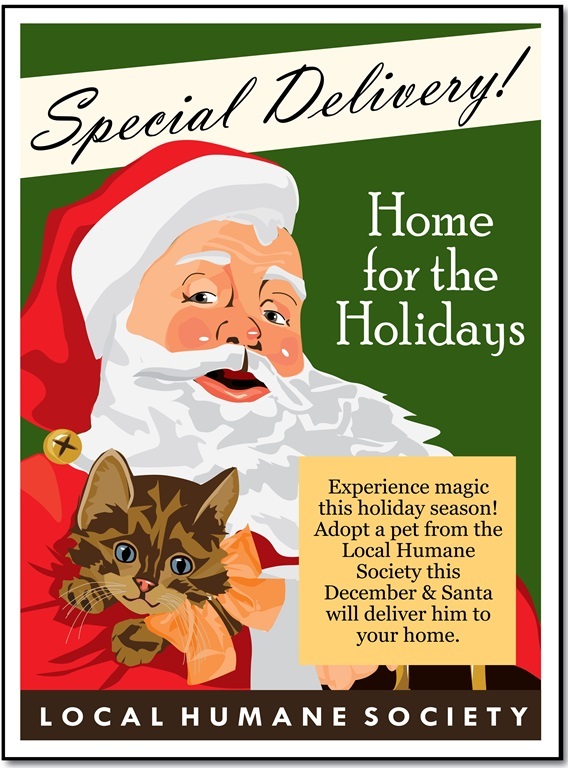 As late as 2008, HSUS was still telling shelters not to do holiday adoptions and discouraging families from seeking to adopt. “Adoption is the best way to add a new pet to any family,” they wrote on their website at the time. “Just wait until after the gifts have been opened and the New Year’s corks have been popped. Your decision to wait may be the best gift you give your family this holiday season.” Thanks to campaigns like Home 4 the Holidays, they are not saying those things anymore. When it comes to saving lives in shelters, as is true with other causes, being the first to come up with a new idea—to the extent that is truly possible—is less important than being among the first courageous enough to embrace that new idea, giving others permission to do the same. When it comes to promoting the No Kill philosophy, our success has absolutely depended on those rogue shelter directors who were willing to take a chance on something new, who read about the success of No Kill among what at the time was just a few shelters, and were willing to buck tradition and the comfort of conforming with the recommendations of large, old and pedigreed organizations which opposed it in order to try something different and hopefully, better. Derek Sivers, in his now famous TED talk “How to Start a Movement”) states that it’s the first follower who gives the innovator legitimacy, transforming the maverick into a leader by giving others permission to follow like he has. In other words, the most important person in making a movement successful is not necessarily the person with the idea, though he is the one who often gets ridiculed for daring to think different. The most important person in making a movement successful is the second guy who joins him/her because that person paves the way for others to do the same. That is its own form of leadership and that is what Home 4 the Holidays did. It followed an idea that was already being done and gave others public permission to follow the follower. In so doing, it gave other shelters the courage to take a risk and buck the stale and deadly conventional wisdom being then-pedaled by HSUS, the ASPCA, the American Humane Association, and regressive shelter directors across the United States. As Sivers explains, “new followers emulate the followers, not the leader.” As the number of followers increase, eventually they hit a tipping point and once controversial ideas become status quo. The end result: those ideas are no longer ridiculed. In fact, it is those who do not embrace that idea who begin to face ridicule. By understanding these facets of human nature—suspicion of change, comfort with the familiar and most of all, the desire for conformity—innovators can help others to overcome the often debilitating inertia that these tendencies foster. Such was the inspiration for Just One Day, an initiative by the No Kill Advocacy Center and Animal Ark launched in 2012. Just One Day is a nationwide campaign which occurs every year on June 11. 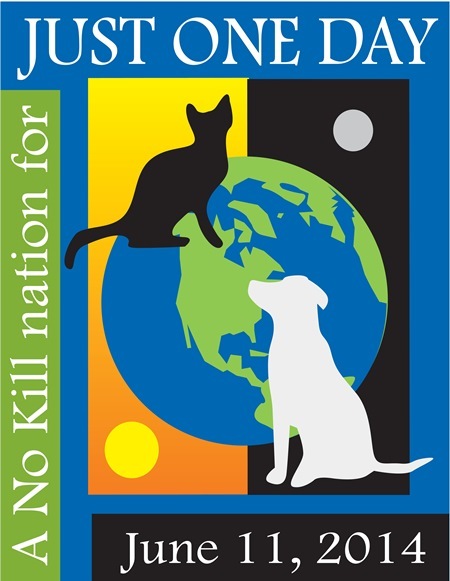 On that day, shelters nationwide are asked to explore and experiment with the programs of the No Kill Equation. Thousands of organizations, including some of the largest animal control shelters in the nation, have answered the call to participate, including those that have been historically hostile to No Kill efforts. Finding safety in numbers, Just One Day gives them permission to experiment with innovation and the results have been dramatic. In its inaugural year, for example, Kern County Animal Control, a shelter I once helped to sue for its non-compliance with animal protection laws, embraced a call “for a No Kill nation” and stayed open for 11 hours. Roughly 100 animals found homes, one every seven minutes the shelter was open. Houston’s shelter, which I assessed several years ago and to which I delivered a blistering critique, opened on a day it was normally closed and placed 231 animals as a result. In Amarillo, Texas, the director of animal control who once said that he would not hesitate to kill every feral cat in the world, reported that by 4:30 pm, 47 animals had been adopted. By 6:30 pm, the number was uncertain as the shelter’s computer system could not update quickly enough to keep up with adoptions. “An exceptional turnout,” said the director. “The parking lot has been full since 10:00 this morning, it continues to be full. I’ve never seen so many people come out here all at one time, in one day.” In an Arizona animal control shelter, 88 out of 100 dogs and 28 out of 30 cats were adopted by 11 am. In another community, they ran out of animals. Yet another reported staff crying: they had never seen so many animals going out the front door in the loving arms of families. For many of these shelters, it was a watershed moment. Not just because animals who would have normally been killed were saved, but because of the valuable lessons hundreds of traditional shelters across the country learned: No Kill is not to be feared. They learned that rescue groups are not to be feared. They learned that the public is not to be feared but rather, embraced and reached out to. And that the people outside the shelters’ walls can be their lifesaving partners—ready, willing, and able to work with them the moment they decide to collaborate. Indeed, one of the primary goals of the Just One Day campaign is to not only save animals through adoption on June 11, it is to get shelters resistant to the principles of the No Kill philosophy—of marketing animals, of asking the public for help, of being open for adoptions at times that are more convenient for the working public and families, of using the media to save lives and of partnering with rescue groups—to commit to trying these ways of operating. When they see the great potential afforded by these innovations, the hope is that many of them will continue to do those things not just on June 11, but on June 12, June 13, June 14, and well beyond. It’s the first step in the larger journey to achieve a No Kill nation. And because of it, some shelters have in fact reported that Just One Day was the impetus for their achievement of a No Kill community. This same principle as to how change occurs is to credit for HSUS’ 2014 announcement acknowledging that pet overpopulation does not exist and that shelters can adopt their way out of killing. These, of course, are not a new ideas; they are ones my organization has been championing for a decade and one that open-admission, No Kill animal “control” shelters across the nation have proved over and over again for many years, despite HSUS’ unrelenting ridicule. And while championing rather than criticizing these programs is a welcome change, again, the marketing of these challenges as “new,” is misleading. None of the five initiatives of the Challenge are new. “Alternatives to Intake” is essentially an embrace of neuter and release for cats who are not social with humans, subsidized neutering, and pet retention programs—all programs No Kill advocates have championed for years (See, e.g., http://bit.ly/JV5dor). “Removing Barriers to Adoption” is an embrace of efforts to increase adoptions through better marketing, more opportunities to adopt, and making it easier to do so (See, e.g., http://bit.ly/198sATv and www.nathanwinograd.com/?p=6359). “Managed Admission” is essentially scheduling animals for admission to a shelter. As No Kill advocates like me and others have long argued, managed admission need not result in cats being released on the street if it is properly administered. A study at a shelter that instituted an appointment system for people wanting to surrender animals (with an exception made for emergencies) found that an animal from that jurisdiction was taken to another shelter only three times the entire year. Meanwhile, the number of stray animals (who were not subject to an appointment system) continued to decline rather than increase as predicted by those who claim that shelters which do not unconditionally accept every animal were putting those animals at risk of abandonment. In other words, managed intake does not increase abandonment rates, even though people like Dr. Hurley regularly made this claim with no hard evidence to back up their assertions. “Return to Field” is the equivalent of TNR for cats who are social to humans, a program that is also not a new idea. For example, the pound in Houston, Texas began a program of neutering and returning social cats in lieu of impound in 2007. Unfortunately, it was not allowed to come to fruition as then Mayor Bill White replaced the people responsible for this change with a highly paid crony. Moreover, San Francisco initiated a similar program in 1999 and 2000, albeit for “nuisance” cat complaints to animal control. Instead of dispatching an officer, the San Francisco city shelter referred the call to the Law & Advocacy Department of the San Francisco SPCA which, among other things, not only tried to resolve the issue with the neighbors, but also neutered and returned such cats back to their neighborhoods, even after they had been impounded by the shelter. In 2000, the Law & Advocacy Department reached agreement with the San Francisco Housing Authority to do TNR on all cats (including cats who are social to humans) living on the dozen or so Housing Authority properties. In 2004, the Tompkins County SPCA began a program to TNR/SNR cats in Tompkins County trailer parks, tackling them one at a time (we had begun the first one when my tenure ended). That same year in Louisiana, a Parish ACO began neutering and releasing all cats in lieu of killing, regardless of whether they were socialized to people or not. And in 1999, during hearings on delaying the implementation of the 1998 Animal Shelter Law in California, several supporters of the law (and thus opponents of the delay) made three key recommendations for shelters that refused to increase their adoption capacity: not accepting healthy cats if shelters were simply going to kill them, not accepting “owner” surrendered cats if shelters were simply going to kill them, and, since the shelters expressed concern about breeding, sterilizing and returning social cats back to the field. The recommendations were met with bitter opposition by the very people (including Dr. Hurley) which now champion them. Finally, “Capacity for Care” essentially amounts to not taking in more cats than a shelter is willing to care for without resorting to killing, as well as providing high quality care and housing for cats while in the shelter (central principles of No Kill sheltering). In one sense, this is what also used to be vilified as “limited admission” by the very groups, like HSUS, which now champion it under a different name. In addition, when I was working for them as a consultant back in 2006, the City of Rancho Cucamonga installed the kind of housing for cats that Dr. Hurley now recommends. For those of us who have been in the No Kill trenches for many decades, enduring the relentless ridicule of the traditional sheltering establishment for championing simple, common sense alternatives to killing, such changes are more than welcome; they are, in fact, the realization of our greatest hopes. The massive paradigm shift we are now witnessing—in which a sheltering culture based on killing and stalwartly defending that killing are giving way to an embrace of lifesaving innovation and a greater respect for the lives of animals—are proof that No Kill is an idea whose time has come not just for the few, but the many. As I wrote nearly 10 years ago, “the more successful this effort is, the more No Kill will shift from being personality based (a result of the efforts of individual leaders) to becoming institutionalized.” That is what efforts like Home 4 the Holidays, Just One Day, and now the Million Cat Challenge do. And that is why I hope to see more of them. *In 2007, I wrote, “like all animals, feral cats also experience the joys of life. Life, by its very definition and common experience, is a mix of easy and hard, good and bad, happy and sad. We experience it as humans. Raccoons experience it, too. So do birds, fox, mice, and rabbits. But that does not lead us to conclude that these creatures should face mass slaughter. As the target of a call for mass extermination, the feral cat stands alone.” I also wrote that “it is not acceptable to kill cats today because some may be killed later if allowed outdoors” and that not only were the benefits of being outdoors underrated, but the “‘risks’ associated with being outdoors—disease, malicious humans, and even predation—are not the primary killers of cats… People in shelters are the number one killer of cats. If we care about cats, we should put programs in place that prevent them from entering these facilities and that provide an opportunity for them to get out alive when they do.” In 2013, Dr. Hurley wrote, “Of course, like any living being, cats are subject to hazards, illness, and eventually, the infirmities of al age and death. However, cats are the only species for which it is routinely argued that a certain death today is preferable, for the cat’s own good, to a possible hazard in the future.” In 2007, I wrote that given that is what shelters have historically done in abundance and many still do today, “If we could kill our way out of this problem, we would have been a No Kill nation many generations ago.” In 2013, Dr. Hurley wrote that killing does not protect cats, “if it did, we would have solved the problem long ago, when shelters were euthanizing 10 times as many cats as they are today.” In 2004, I wrote that given that we cannot kill our way to No Kill, we should just stop and employ other strategies like TNR: “stop the killing, stop the killing, stop the killing.” In 2013, Dr. Hurley wrote, “If it’s not helping, it won’t hurt to stop” and “we can just stop euthanizing healthy cats.” There’s more. Although it took six years (from 2007 to 2013), Dr. Hurley’s evolution from champion of killing to a champion of greater lifesaving is remarkable, one I chronicled here and one that I hope will continue. Yet she still has three major hurdles to overcome in order to bring her philosophy and advocacy in line with what is truly in the best interest of the cats on whose behalf she claims to speak. The first is her false belief that no one wants to kill. Given that her Million Cat Challenge makes it very easy for shelters not to—essentially mandating things not to do rather than things that must be done—there can be no other conclusion when some shelters refuse to embrace it. At the very least, she must conclude that directors who choose to continue admitting cats only to kill them certainly find killing preferable to implementing a change, and at the end of the day, that is a distinction without a difference. Given that the other two areas in which she is still blind to the truth stems from this misperception, the sooner she does, the better for cats. The second is her focus on “healthy” cats. Healthy cats are not the only ones who are dying. Sick, injured, unweaned and traumatized cats are, too, and the No Kill movement has already proven that through foster care, medical and behavior rehabilitation and even palliative care, admission to a shelter need not be a death sentence for these animals, either. While it is certainly acceptable to tackle evils one at a time—to explain to shelters how they can immediately stop killing healthy cats—it is not okay to portray an end to the killing of this one group of animals as the end of the innovation that our shelters must embrace in order to truly meet their mandates. This is especially true given that most of the changes Hurley is asking shelters to embrace require shelters to do less with cats, not more. (See www.nathanwinograd.com/?p=13394 and www.nathanwinograd.com/?p=14422). Unfortunately, despite her relentless assurances that shelter directors care and want what is best for animals, she is not prepared to demand that these shelters work harder to do the job entrusted to them with dedication and determination, something that would naturally flow from true caring. Instead, she merely asks them to not take in cats they are unwilling to care for without killing, especially ironic given Hurley’s past position on this very issue. Though for years Dr. Hurley railed against “limited admission” shelters, arguing that they placed cats at risk of abandonment, her about face on this issue misses another of the main points of shelter reform beyond an end to killing: our focus should also be on getting shelters to provide the kind of care they are being paid to provide so that the needs of every individual animal entering such a facility are met, be it rehoming, foster care, medical care, or behavior rehabilitation. Instead, Hurley portrays the issue as too back and white, arguing that shelters in their current manifestation—meaning lacking all the programs and services of our nation’s most successful No Kill shelters—should not be forced to expand their safety net of care, but rather, be let off the hook of doing their job entirely if they get to the point where doing anything other than killing becomes too arduous. There is a middle ground that is much more responsible, much more humane, and much more in keeping with what the animal loving taxpayers who fund their local shelter have a right to expect: a shelter that has fully and comprehensively implemented each and every program of the No Kill Equation so that cats are not only no longer killed out of habit and convenience, but are provided the kind of proactive care that we owe them. Like HSUS, will Kate Hurley continue to provide such regressive, uncaring and even lazy shelter directors the political cover they need to continue resisting innovation by perpetuating the myth that no one wants to kill, that our shelters are uniformly caring places and that shelter directors can be trusted with the discretion as to whether or not the animals in their care live or die? Or will she recognize her duty to embrace the most powerful tool we have in a legal republic to reform the culture of unprofessionalism and uncaring so endemic to our nation’s shelters that was both fostered and enabled by the paradigm of shelter killing she once so tenaciously championed, legislation? I hope we don’t have to wait another six years to find out.